Michael Brian Young (born October 19, 1976) is an American former professional baseball infielder who played with the Texas Rangers, Philadelphia Phillies, and Los Angeles Dodgers during his 14-year career. Originally a second baseman, the versatile Young was a five time All-Star at shortstop, once at third base, and once as a combination designated hitter and utility infielder. He was the 2005 American League batting champion. Young played baseball in high school at Bishop Amat Memorial High School and in college at University of California, Santa Barbara (UC-Santa Barbara). He was originally drafted by the Baltimore Orioles in 1994, but elected to return to college and was eventually drafted in 1997 by the Toronto Blue Jays. After spending several seasons in the minor leagues with the Blue Jays, they traded him to the Rangers where he spent over a decade. While with the Rangers, he set several club records in offensive statistic categories including runs scored and total bases. Young attended Bishop Amat Memorial High School in La Puente, California, followed by the University of California, Santa Barbara, to which he later donated money to refurbish the school's baseball field. Young was drafted by the Baltimore Orioles in the 25th round of the 1994 Major League Baseball Draft but did not sign. Three years later the Toronto Blue Jays selected him in the fifth round of the 1997 Major League Baseball Draft. Young signed with the Blue Jays, who traded him in 2000 with pitcher Darwin Cubillán to the Rangers for Esteban Loaiza while Young was still in their minor league system. Young made his professional debut in 1997 with the St. Catharines Blue Jays in the New York-Penn League (NY-Penn) (short-season A). Among his achievements in the NY-Penn League were a 16-game hitting streak, tying for fifth in the league with 48 RBIs, and tying for third in the league with 136 total bases. In 1998, he spent the season with the Hagerstown Suns of the South Atlantic League. Playing second base, he led all players at his position in fielding percentage. 1999 would be an all-star season for Young. Playing for the Dunedin Blue Jays of the Florida State League, he earned spots on both the midseason and postseason all star teams by leading the league in doubles and finishing fourth in batting average and hits, .313 and 155 respectively. After the regular season, he played for the Rancho Cucamonga Quakes in the California Fall League. He split 2000 between Double-A and Triple-A and, on July 19, was traded to the Rangers. The Rangers purchased his contract on September 27 and he played the final five games of the season in the majors making his debut as a pinch runner. Though he began, 2001 in Triple-A, he was recalled to the majors on May 25 and did not return to the minors at all during the season. Young reached the Majors briefly in 2000, playing 2nd and getting two at-bats. He hit .249 in 106 games as a second baseman in 2001. In 2002, Young placed second in fielding among second basemen with a .988 fielding percentage. In 2003, Young was 3rd in the league in hits with 204, and led all second baseman with a batting average of .306. Young had a fielding percentage of .987. After signing a new contract, Young moved to shortstop, filling the hole left by the departure of regular Ranger's shortstop Alex Rodriguez in 2004, to make room for newly acquired second baseman Alfonso Soriano. He was second in the American League in hits with 216 and at bats with 690, fourth in runs with 114, and ninth in batting with an average of .313. He spent 89 games hitting in the leadoff spot, the last time in his career that he hit leadoff prior to 2013. Young won the AL batting title in 2005 with an average of .331, and was first in MLB in hits with 221. He was second in AL in at bats with 668, and his 114 runs were fifth-best in the AL. Young also established a career-high in home runs with 24. Young's 91 RBIs placed him second among all shortstops in the AL. On February 14, 2006, Young and Rangers teammate Mark Teixeira were selected to the United States roster for the 2006 World Baseball Classic. At the conclusion of the 2006 MLB All-Star Game held at PNC Park in Pittsburgh, Pennsylvania, Young was awarded the Ted Williams Major League Baseball All-Star Game MVP Award after hitting a game-winning two-run triple in the ninth inning. Young led the American League in fielding percentage at shortstop with .981. Young also played all 162 games of the 2006 season. In March 2007, Young agreed to an $80 million contract extension that would have kept him with the Rangers until 2013. Young finished the 2007 season with a batting average of .315, which led the Rangers and was 11th-highest in the AL. Young also led the Rangers with 94 RBIs and was second among all shortstops in the AL. Young was second on the team and tied a career high in stolen bases with 13. Young's 201 hits were 4th in the AL, and marked the 5th consecutive 200-hit season, joining Ichiro Suzuki and Wade Boggs as the only players to do so since 1940 and just the second middle infielder, along with Charlie Gehringer, to have accomplished that feat. Young played in the longest All-Star game in history. He drove in the game-winning RBI at the 2008 MLB All-Star Game after four hours and 40 minutes of playing time. Also, in 2008 Young won the Gold Glove at shortstop for the American League. In 2009, Young moved to third base to make room for shortstop prospect Elvis Andrus. The Rangers did not consult Young on this, and he requested a trade. He subsequently rescinded the request. On April 19, 2009, Young hit his first career walk-off home run, off Royals pitcher Kyle Farnsworth. Young was voted on the AL 2009 All Star team by the players. On June 16, 2010, Young hit a ground ball up the middle to collect his 1,748th career hit, and pass Ivan Rodriguez to become the Rangers' career leader in hits. On defense, in 2010 he tied for the AL lead in errors by a third baseman, with 19, and had the lowest fielding percentage among them, at .950. During the 2010–11 offseason, Young said that the Rangers had "misled and manipulated" him and requested a trade. The Rangers, having acquired free agent third baseman Adrián Beltré, planned to have Young be the team's primary designated hitter as well as a utility infielder, and see time at first base for the first time in his career. He was a 2011 American League All Star. On August 7, 2011, Young hit an infield single against Josh Tomlin of the Cleveland Indians for his 2,000th career hit. In 2011, Young batted .338 (3rd in the American League) with 11 home runs, primarily splitting his time between DH (69 games), third base (40 games), and first base (36 games). He tied with Adrian Gonzalez for the AL lead in hits (213), and was 5th in RBIs (106) and sacrifice flies (9), 8th in on-base percentage (.380), and 10th in doubles (41). After Young struggled in the 2012 season, the Rangers asked Young if he desired a trade, as they planned to cut his playing time for the 2013 season. Young did not request one, but the Rangers began to pursue a trade, and eventually traded him to the Philadelphia Phillies. Since being traded in 2012, the Rangers have not issued Young's uniform number 10 to any player or coach leading some to believe that the Rangers may one day retire #10 in honor of Michael Young. At the time of his departure from the team, Young lead the Rangers in several stat categories including games played (1774), hits (2178), doubles (406), triples (55), runs scored (1057), at bats (7221), strikeouts (1132), extra-base hits (632), and total bases (3210). He was third all time in runs batted in (RBIs) with 962 and sixth all time in home runs with 172. He also held several single-season records including most multi-hit games (70 in 2004), most hits (221 in 2005), doubles (52 in 2006), and at bats and plate appearances in 2006 (691 and 748 respectively). Young agreed to waive his no-trade clause and on December 9, 2012, was traded to the Phillies in exchange for pitcher Josh Lindblom and minor league pitcher Lisalverto Bonilla. The deal reunited him with former teammates Laynce Nix, Cliff Lee and Mike Adams. The Phillies were monitoring Young for some time prior to his acquisition. Their former Hall of Fame third baseman Mike Schmidt said, "we got a Derek Jeter kind of player on our team all of a sudden ... He's two or three Michael Young years away from being a Hall of Famer, first ballot maybe." Phillies general manager Ruben Amaro, Jr. and manager Charlie Manuel also were fond of Young and made him a target headed into the Winter Meetings. Once they agreed to a deal, Young had to approve it, which he did, later mentioning that he would only have done so to go to a winning team like the Phillies. The Phillies viewed Young as a stop-gap to get them to top prospect Cody Asche. In 126 games with the Phillies, he hit .276 with 8 homers and 42 RBI. However, the Phillies did not turn out to be the "winning team" that Young had expected. On August 31, the Phillies' record stood at 62–74, and they were 21½ games out of first place and 14 games out of the last available playoff spot. He was traded to the Los Angeles Dodgers. Upon leaving Philadelphia, Young released a statement in which he thanked the Phillies and said that he "had a blast" playing in Philadelphia and that he would recommend it "in a heartbeat" to any other player. Phillies players, namely younger players such as Darin Ruf and Cody Asche, commented that they loved having a veteran like Young to whom they could look up and seek advice from. Ruf said, "He was the type of guy to come up to a younger guy like myself or Cody and tell us a thing or two about what he thinks we need to do and how he thinks we could prolong our careers. He was just a great teammate to have around." On August 31, 2013, he was traded to the Los Angeles Dodgers for minor league pitcher Rob Rasmussen. In the last year of his contract, Young again waived his no-trade clause in order to join his hometown team for an expected playoff run. Young was acquired to be a backup infielder and provide a veteran presence on the team. Young made his Dodgers debut on September 1, 2013 pinch hitting in a game against the Colorado Rockies. 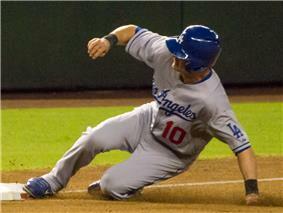 He appeared in 21 games for the Dodgers at a variety of positions and hit .314. After initially considering some offers as a free agent, Young chose to announce his retirement from baseball on January 31, 2014. Young's mother is of Mexican descent. Young met his wife Cristina, also of Mexican descent, while in high school. They have three sons named Mateo, Emilio, and Antonio respectively. Young is a cousin of former WBO Light Welterweight boxing champion Zack Padilla. Another of his cousins, Jason Young, also played minor league baseball. Young is also a philanthropist. He and his wife are sponsors of the Wipe Out Kids' Cancer campaign. In 2006, Young began the Young Heroes Scholarship Program, and in 2010, the Michael Young Family Hispanic Scholarship Program was established. In July 2011, Young and his wife announced the launch of the Michael Young Family Foundation, a charity which supports the involvement of children's health in all areas: physical social, mental, and educational. Young is represented by baseball agent Dan Lozano. Young is a two-time winner of the Marvin Miller Man of the Year Award winning in 2008 and 2011. He is one of only three players who have won multiple times (John Smoltz and Jim Thome). Young's hobbies include billiards and golf. ^ "Michael Young". The Baseball Cube. Retrieved October 25, 2010. ^ "Alumnus Starting in World Series". The Daily Nexus. October 27, 2010. Retrieved October 27, 2010. ^ Newberg, Jamey (July 19, 2007). "Swapping Stories: The Young trade". texasrangers.com: News. MLB Advanced Media. Retrieved May 22, 2013. ^ a b Clark, Bonnie, ed. (February 2013). 2013 Philadelphia Phillies Media Guide. Philadelphia, Pennsylvania: The Phillies. pp. 181–184. ^ "Texas Rangers sign Michael Young to contract extension". texasrangers.com: Official Info. MLB Advanced Media. March 2, 2007. Retrieved June 26, 2013. ^ "2004 American League Batting Leaders". Baseball-Reference.com. USA TODAY Sports Digital Properties. Retrieved June 26, 2013. ^ Branch, Chris (June 6, 2013). "Michael Young is hitting leadoff for the first time since 2004". ^ "2005 American League Batting Leaders". Baseball-Reference.com. USA TODAY Sports Digital Properties. Retrieved June 26, 2013. ^ Sullivan, T.R. (February 15, 2006). "Teixeira, Young tabbed for Team USA". worldbaseballclassic.com - MLB.com: News. MLB Advanced Media. Retrieved March 4, 2014. ^ Associated Press. "Rangers' Michael Young named All-Star MVP after two out rally in the ninth". KTEN.com. WorldNow and KTEN. Retrieved June 26, 2013. ^ "Michael Young Stats, Video Highlights, Photos, Bio". phillies.com: Team. MLB Advanced Media. Retrieved June 26, 2013. 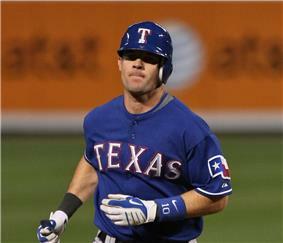 ^ "Texas Rangers sign Michael Young to contract extension". ^ Sullivan, T.R. (March 2, 2007). "Young helps Rangers build stability". ^ Sullivan, T.R. (January 15, 2009). "Young will shift to third base". ^ a b Grant, Evan (December 8, 2012). "Sources: Michael Young willing to accept trade to Philadelphai; details still must be finalized". Texas Rangers Blog - Dallas Morning News. ^ Sullivan, T.R. (April 19, 2009). "Young's walk-off homer lifts Rangers". ^ Sullivan, T.R. (July 16, 2010). "Young now tops on Texas' all-time hit list". ^ "2010 Regular Season MLB Baseball 3B Fielding Statistics". Espn.go.com. Retrieved October 18, 2011. ^ "Rosenthal: Michael Young Q&A". Msn.foxsports.com. February 8, 2011. Retrieved October 3, 2011. ^ a b c "Michael Young Statistics and History". Baseball-Reference.com. Retrieved October 3, 2011. ^ Tesfatsion, Master (August 8, 2011). 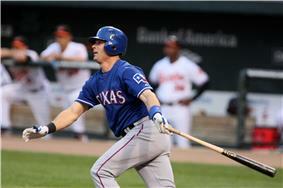 "Texas Rangers' Michael Young collects his 2,000th career hit". ESPN Dallas. ESPN Internet Ventures. Retrieved December 8, 2012. ^ a b c "Texas Rangers Top 10 Batting Leaders". Baseball-Reference.com. Sports Reference. Retrieved April 14, 2013. ^ Hagen, Paul. "Phillies acquire veteran Michael Young from Rangers". phillies.com: News. MLB Advanced Media. Retrieved December 8, 2012. ^ Sullivan, T.R. (December 9, 2012). "Rangers deal Michael Young to Phils for two right-handers". MLB.com: News. MLB Advanced Media. Retrieved December 9, 2012. ^ Hagen, Paul (April 2013). Bonnie, Clark, ed. "Young Professional". Phillies Magazine (Philadelphia, Pennsylvania: Philadelphia Phillies) 2013 (1): 33–36. ^ Brookover, Bob (September 2, 2013). "Phillies Notes: Phils add well-traveled lefty in Michael Young trade". ^ Randhawa, Manny (September 1, 2013). "Young left lasting impression in short Philly stint". phillies.com: News. MLB Advanced Media. Retrieved September 2, 2013. ^ Shaikin, Bill (September 1, 2013). "New Dodger Michael Young: Has he been a regular, or not?". ^ Shaikin, Bill (September 1, 2013). "New Dodger Michael Young: Has he been a regular, or not?". Los Angeles Times. ^ Gurnick, Ken (September 2, 2013). "Los Angeles Dodgers at Colorado Rockies - September 2, 2013". MLB.com Recap. MLB Advanced Media. Retrieved September 2, 2013. ^ Gleeman, Aaron (January 30, 2014). "Michael Young is retiring". HardballTalk. NBC Sports. Retrieved January 30, 2014. ^ Sullivan, T.R. (January 30, 2014). "Longtime Rangers staple Young retires". mlb.com. Retrieved January 31, 2014. ^ "Michael Young Biography". JockBio. October 19, 1976. Retrieved October 25, 2010. ^ "Texas Rangers News". Dallas Morning News. July 16, 2006. Retrieved October 25, 2010. ^ "Wipe Out Kids' Cancer: Home". Wokc.org. May 1, 2010. Retrieved October 25, 2010. ^ Heyman, Jon (March 2, 2011). "For Michael Young, it's business as usual". SI.com - Daily Scoop (Time). Retrieved April 14, 2013. ^ Andro, Anthony (November 3, 2011). "Young tabbed Marvin Miller Man of the Year". Fox Sports Southwest. FOX Sports Interactive Media. Retrieved May 22, 2013. ^ "Michael Young: Biography and Career Highlights". Texas.rangers.mlb.com. Retrieved October 25, 2010.